The Caribbean Tourism Organization (CTO) collects donations through the CTO Relief Fund for relief efforts in any of our member countries affected by hurricanes and to assist other Caribbean countries affected by natural disasters. 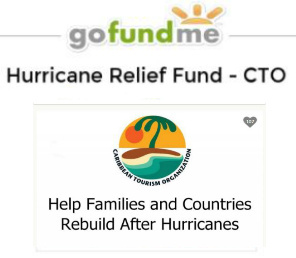 Monies raised through this GoFundMe account will be sent directly to tourism officials in CTO member destinations affected by Hurricanes Irma and Maria. The CTO appreciates all donations to assist in the recovery efforts of these countries. The video below presents a general update from countries affected by the 2017 Hurricanes reporting at December 2017. A Tourism Recovery Round-Table was held as part of the Climate Smart conference during which 6 affected countries provided updates on their state of tourism readiness: Anguilla, Dominica, St. Maarten, Antigua and Barbuda, Turks and Caicos and British Virgin Islands. The CTO Hurricane Relief Fund has “501(c)(3)” status, which means it has been approved by the USA Internal Revenue Service as a tax-exempt, charitable organization. You can make donations to the CTO Hurricane Relief Fund through Paypal Giving. To donate, go here: Donate with Paypal Giving Fund. View a list of national disaster relief agencies and their contact information. View list of various Caribbean relief support campaigns from business and agencies.